“This screening has proved unexpectedly popular,” says the woman working at BFI Southbank, as I squeeze into a seat at the small, packed venue. It can only mean one thing: the name ‘Studio Ghibli’ still carries its usual weight, the Japanese studio a high profile co-producer of this French/Belgian animation, director Michael Dudok de Wit’s first feature length picture. And with the name comes certain expectations of style and content, but be in no doubt: this is de Wit’s film, sparse, beguiling and so very ‘European’. We begin with an unnamed man shipwrecked on a deserted island. Lost and alone, he begins to explore his surroundings: finding food, finding shelter. Naturally his mind turns to escape, and building himself a raft, he sets off into the ocean. But a massive Red Turtle bars his path, destroying his raft and sending him back to square one. And so a confrontation begins, a strange bonding that takes us unusual places and spans a length of many years. To elaborate any further would be to spoil a film that is far more than it initially presents itself to be; a simple fable becomes something quite esoteric, steeped in metaphor and understated character drama. And by understated I mean utterly without any dialogue. The odd scream and shout aside, The Red Turtle is pure animation, music and movement, slow and quiet but rarely the worse for it. It helps that this animation is frequently superb, though again understated in its own way: This is a world of simple lines and flat colours, with little beady dots for eyes that are more Herge than they are Miyazaki. It starts to flag in its later stages, when its simple storytelling and sense of momentum give way to something far more static, more reflective. A story of island escape is easier told without dialogue than a story of island life, and as The Red Turtle makes the switch it leans heavier on allegory and hallucination: still a pleasure but a good deal less exciting, and often frustratingly hard to interpret. Moments of amusing animal-based physical comedy aside, anyone coming to this looking for Ghibli-style fare is sure to be disappointed. 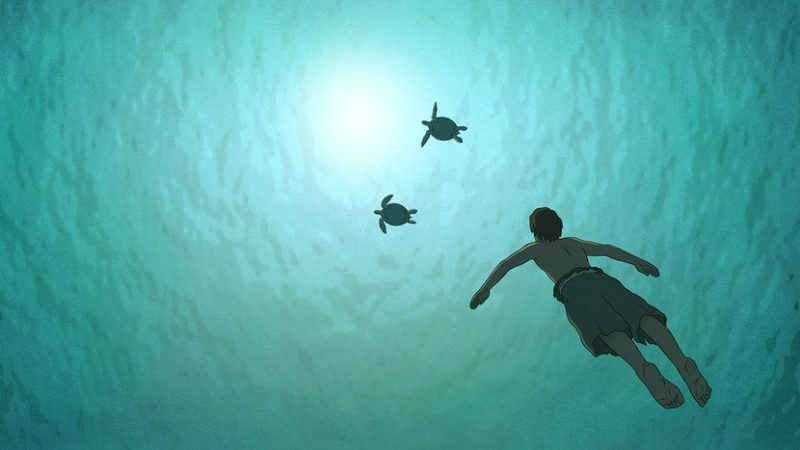 The Red Turtle is a strange beast: interesting themes around mankind’s growing distance from – but inescapable connection to – the natural world are there, but too often obscured in an increasingly self indulgent second half. But there is a pure, visual joy in its opening twenty minutes that it never fully loses, making The Red Turtle – if not a classic worthy of Miyazaki – still more than worth your time. This entry was posted on Wednesday, October 5th, 2016 at 8:00 am	and is filed under Events, Features, Film, Review.